China started work last month on a 3 billion yuan ($476 million) nuclear power project, reported China news agency Xinhua. This will be the first project in the world to put a reactor with fourth-generation features into commercial use. China Huaneng Group, China Nuclear Engineering Group Co and Tsinghua University are investors in the plant. Construction of the project is underway at Shidao Bay in the coastal city of Rongcheng, east China’s Shandong Province. The reactor is expected to start generating power by the end of 2017. With a designed capacity of 200 megawatts and “the characteristics of fourth-generation nuclear energy systems,” the reactor has been developed by China’s Tsinghua University. It can also raise electricity generation efficiency to around 40 per cent from the current 30 per cent level of second – and third-generation reactors, said the statement. China had 15 nuclear power-generating units in operation with a total installed capacity of 12.54 GW, and another 26 units currently under construction will add a further 29.24 GW, according to a government white paper on energy policy released in October 2012. 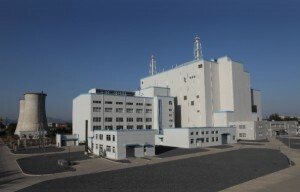 China could look at exporting the technology and equipment of the reactor to other countries. “That will be a great boost to China’s nuclear industry, as a very high percentage of the equipment is produced domestically instead of being imported,” an HSNPC public relations officer was quoted by the news agency. This reactor was scheduled for a 2011 launch but construction was put off after a tsunami hit nuclear facilities at Japan’s Fukushima plant in March 2011.